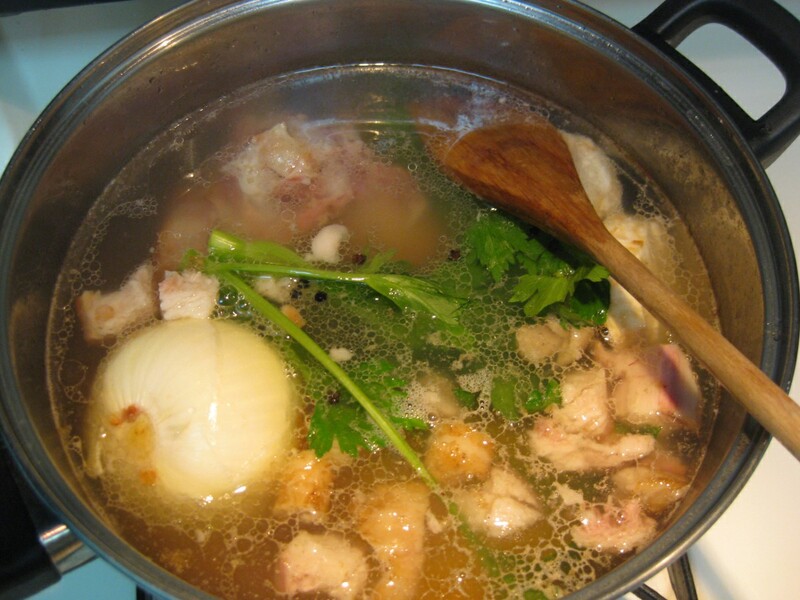 Here is a recipe for a simple soup you can make from bones (kosti) left over from other dishes, such as the baked meat. 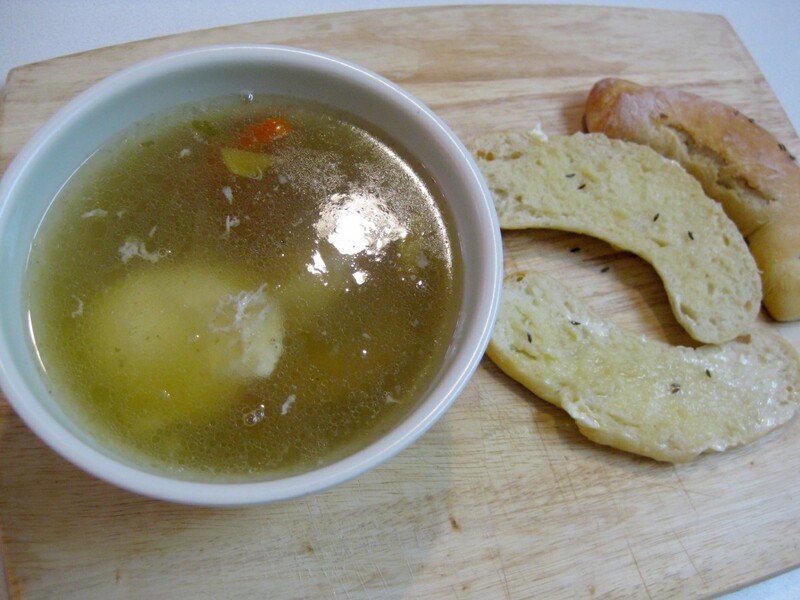 Turning the left overs into soup is a great way to reduce waste and stretch your meal dollar further. Put the bones in a pot of water. If you have any other left over meat pieces, add those too. Cook on low heat – the soup should not be steaming, but not actually boiling. This way you’ll end up with a clear soup, otherwise it would get murky. Cook like this for an hour. Then add various root vegetables and also a whole onion. We used carrots (mrkva), celery (zeler) stalks and root, and turnips. 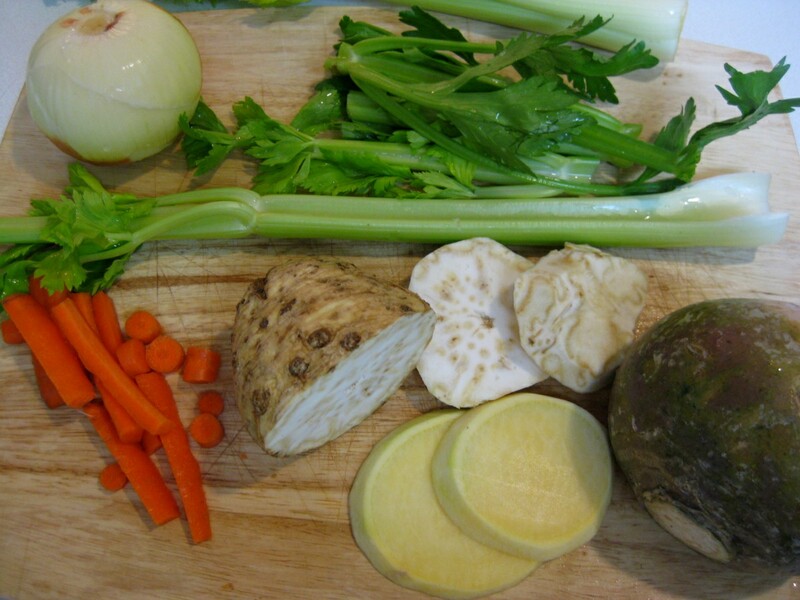 The turnips were put in instead of kohlrabi (kaleráb), popular root vegetable in Slovakia. 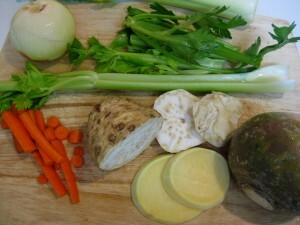 Also add parsley root if you have any. Salt and pepper to taste and also add other herbs you like. 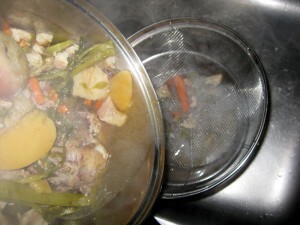 Continue cooking until the vegetables soften. Then strain the soup to remove the “stuff”. Bring the liquid to boil again. Then reduce the heat and slowly ease-in an egg or two. This is how my mom serves this soup. 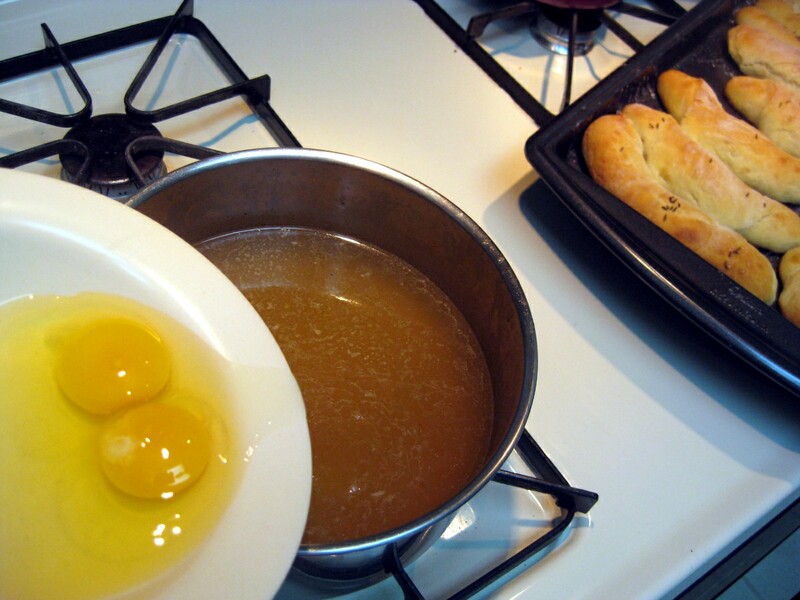 Of course, you don’t have to make it with poached eggs, you can add in noodles, dumplings, or rajbanička (grated dough). Cook the eggs for about 5 minutes. To serve, scoop out the vegetables into a bowl. Pour the liquid broth (with the egg) over it. Enjoy! I actually made this soup about a week before Thanksgiving, but only got to posting it today since I was really busy with school. I spent my Thanksgiving in West Virginia. 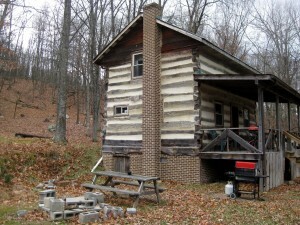 My friend Sandra and I rented a rustic wilderness cabin from Wildernestinn.com. The cabin we stayed in was called Wildwood and it was absolutely awesome. 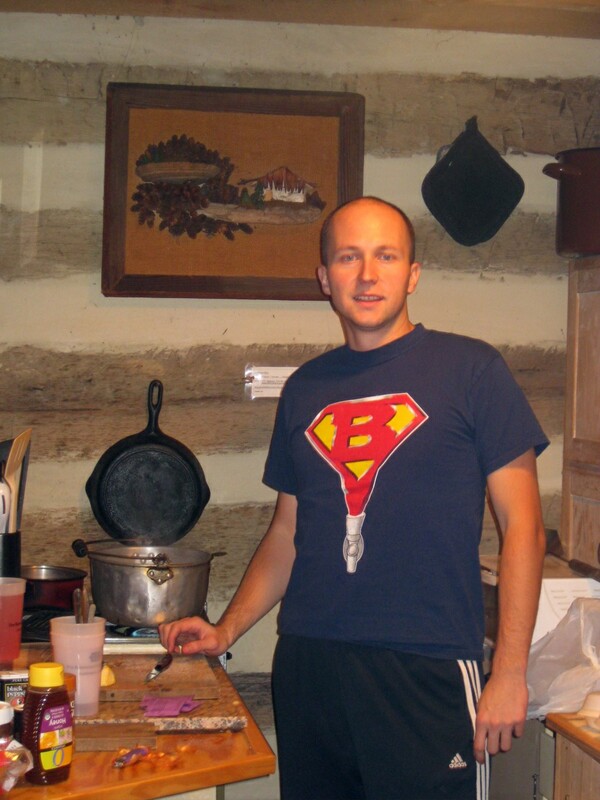 It’s a two story log cabin from the 1800s, but it’s been upgraded with a hot shower, small kitchen, and electric heaters. It even has a fireplace and a porch with grills (it was too cold to use these). The cabin is located not too far away from Seneca Rocks, 5 minutes down a forest road off a 2 lane road in a small village by a lake. The view from the kitchen is amazing – nothing but trees. I was hoping to see some bears (there is plenty of bear photos on the Wildernest Inn Facebook page), but all we saw was deer. The second day we drove up to the top of Spruce Knob, West Virginia’s Highpoint, and also visited Seneca Rocks. On the way back, we stopped for dinner at Yokum’s Restaurant. I asked the waiter if he happened to have any bones, and he and possibly his mom came out with a big bag of leftovers from Thanksgiving. It was awesome. 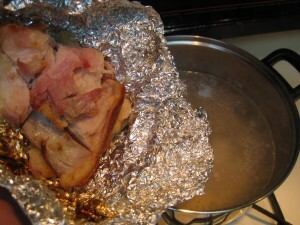 So the bones went into the soup, this second time, it was turkey flavored. 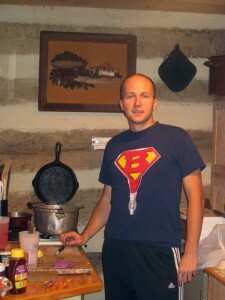 Making this bone soup again at the Wildwood wilderness cabin in West Virginia.